The Mystery of the Dead Man's Riddle (1974) is the twenty-second book in The Three Investigator series and the sixth title penned by "William Arden," a penname of Dennis Lynds, who has become my favorite contributor to this series and this fast-paced, cleverly concocted story demonstrates why. A near classic example of the code-breaker. Traditionally, the book begins with an introduction by the reluctant mentor of the three boys, Alfred Hitchcock, who denies any involvement in the shenanigans of the late Marcus "Dingo" Towne. Hitchcock tells the reader that "the old scoundrel" had no right to involve him "in his scheme from beyond the grave," but humbly points out that without his cunning the problem would have remained unsolved, because he handed over the case Jupiter "Jupe" Jones, Pete Crenshaw and Bob Andrews – known locally as "the junior detective team" of The Three Investigators. And they tackle the problem with a great deal of energy, enthusiasm and determination. Marcus "Dingo" Towne was an old Australian, "who made his pile by hard work," but sees no reason to it all to his "shiftless, greedy, stupid and otherwise useless" family. So he only left his daughter-in-law, grandson, niece and nephew "the sum of $1.00 each." What remained of Dingo's hard-earned pile was turned into gemstones. A million dollars worth of opals, sapphires, rubies and emeralds, which belongs to the person clever enough to find it – which can be done by cracking a six-part riddle. Dingo was a cunning man who laughed to taunt and laugh at people. This is reflected in his complex, multi-layered riddle that's loaded with hidden riddles, double clues and even "a shortcut clue" that can only really be spotted by readers with an encyclopedic mind with a storage capacity for arcane knowledge. Dingo had appointed Hitchcock ("who likes mystery") as one of his executors and he's contacted by Dingo's daughter-in-law, Molly Towne, who's worried that her almost 8-year-old son, Billy, is getting cheated out of his inheritance. Her fiance and lawyer, Roger Callow, plans to challenge the will in court, but, by that time, the gemstones might already be found. And the finder has no reason to come forward. So the famous movie-director advised them to give Jupe, Pete and Bob a chance to crack the code. 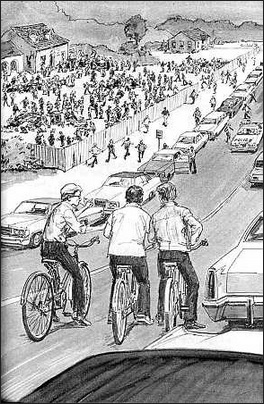 However, they soon find out that this is not going to be one of those ordinary, dime-a-dozen treasure hunts of popular juvenile fiction, but an out-and-out rat race. When they arrive at the saggy, dilapidated house of Dingo, there's a crowd "swarming the property like ants" and fighting over a collection of empty bottles in the yard that are being mistaken for clues – one of the treasure seekers is their long-time nemesis, "Skinny" Norris. Unsurprisingly, Norris acts like a proper nuisance throughout the story and is responsible for the thrilling scene depicted on the covers of practically every edition of this title. This time, his actions aren't merely motivated by his dislike for the three detectives, particularly Jupe, but by an opportunity to upstage them by finding a small fortune in precious stones. And this is one of the many aspects that makes The Mystery of the Dead Man's Riddle standout in the series. There are, however, more people who try to get their hands on the gems or appear to be very interested in the movements of Jupe, Pete and Bob. Cecil and Winifred Percival are Dingo's niece and nephew from England and they're proper pair of Disney-like villains who come within inches of getting the treasure, but the boys are also shadowed by two men in a blue car – one of them being a giant of a man. But they also have a loyal ally in Billy Towne. The 8-year-old wants to be a detective, who even appears at one point wearing a cape and deerstalker, but Billy proves to be a burden during the first half of the story. However, he's able to redeem himself by solving one of the riddles and used their Ghost-to-Ghost Hookup to help the trio out of a real jam. A great example of how to use such a young character in a mystery story. These characters are roaming around Rocky Beach, California, which is fantastically employed here by Arden and constantly moving these characters across the map is what this such a fun, fast-paced novel. One of my favorite scenes is when they take the bus out of town to followup on a clue, based on fare zones and the travel habits of Dingo, but on their way back they see the Percivals are on their track. And a sweaty, red-faced Norris is seen digging holes around a billboard. This really gives you an idea that this is a race and not a leisure treasure hunt. But the absolute highlight of the story is how every event and character are either directly linked or interconnected, which means that everything has a reason without a single side-distraction to pad out the plot – something I feared would be the case when the two gangsters turned up. Even they had a reason for being present that linked up with the main plot. This also goes for the people who witnessed the will and were assigned executor to the quaint tea shop Dingo used to frequent. There are puzzle-pieces all over the place! So the plot is pretty tight and the only thing that can be said against it's not a solve-it-yourself type of detective story. I guess you can compare the plot-structure of The Mystery of the Dead Man's Riddle with G.K. Chesterton's "The Blue Cross" from The Innocence of Father Brown (1911). As impressive as the tricky plot of this juvenile mystery is how Arden made the lingering presence of Dingo's forceful personality emerge as an omniscient puppeteer by the end of the story. Dingo came out on top as the undisputed winner and he did it without even taking a breath. What can I say? Beware the Eternal Aussie! 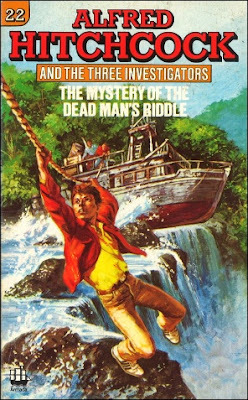 So, all in all, The Mystery of the Dead Man's Riddle is a well-written, fast-paced and nicely characterized entry in the series with a code-breaker plot that makes it rank alongside The Mystery of the Whispering Mummy (1965), The Secret of Skeleton Island (1966), The Mystery of the Shrinking House (1972) and The Mystery of the Headless Horse (1977). But that meant that it came out at the tail end of the series, and I immediately recognised that this was of a much higher quality than the stories preceding it. At that point in time I wasn't aware that it was published out of order (so I was fairly bewildered that Hitchcock was suddenly back again), I was just happily surprised by such a good 3I book again. Now that you mention it, this must be a nightmare title to translate. Not only do the riddles have to make sense in another language, but the translation has to correspond with the locality of the story. And then there's the problem that the English language is the key needed to make sense out of the riddles. This is a common problem with dying clues and codes messages in Japanese mysteries like Detective Conan. A notable effort was made by the translator of Smoke and Mirrors, an early title of the original Kindaichi series, who created a whole new dying message and solution based on the art work, because the real clue was impossible to translate. Yep, word clues are really tough. I try to translate the Jonathan Creek subtitles to Swedish, and man, some of those are hard. In some cases it's important that they work with the visual clues, and often Renwick uses them for some kind of pun or wordplay which makes it even harder to do something worthwhile with it. In some cases, I must admit that I give up and just use the English clue. Ah, yes, the scourge of the untranslatable pun! One of those puns costed us a short story in the English edition of Paul Halter's The Night of the Wolf. One of my favourites, this is a neat round-up of the plot and good to know other people are still appreciating the novels! Now if only someone decided to reprint this series in its entirety, I'm sure even more people would be enjoying it!